You want to know what happened, what is happening, what will happen. You want to know why, how and for how long? You want to know because you think that knowing will give you peace. We have created colleges and courses, Google and Wikipedia to answer questions and to question answers and none of it give us peace. 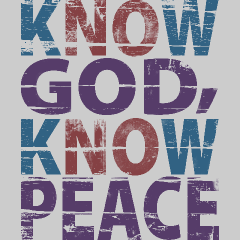 Peace doesn’t come from knowing all the answers, it comes from knowing the all powerful God. In Christ you are known fully and fully equipped to know God. You won’t always get the answers you want to have when you want to have them but in Christ you will always have access to God.